Across the country , thousands of trained volunteers bring peer-led programs to a wide variety of community settings, from churches to schools to NAMI Affiliates. With the unique understanding of people with lived experience, these programs and support groups provide outstanding free education, skills, training and support. 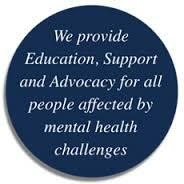 NAMI Family-to-Family – is a class for families, partners and friends of individuals with mental illness. The course is designed to facilitate a better understanding of mental illness, increase coping skills and empower participants to become advocates for their family members. This program was designated as an evidence-based program by SAMHSA. Our Chapter offers a FREE 12 week Family-to-Family program on living with a loved one who has a mental illness. The course is offered in the spring and fall and is taught by trained family members. You must register to attend the spring or fall course. For information, please call the office at (610) 623-0071 or email namipadelco@verizon.net to register. For Course Content Questions Contact Instructors : Jeanette 484-326-0163 and/or Kristen 610-213-9075. NAMI Peer-to-Peer – is a recovery education course open to anyone experiencing a mental health challenge. The course is designed to encourage growth, healing and recovery among participants. Our Chapter offers a FREE 10-week course teaching people with mental health issues that they are not alone. It is taught by a team of people who are peers themselves. For information, please call the office at (610) 623-0071 or email namipadelco@verizon.net to register. For Course Content Questions Contact the Instructors: Julie 610-804-9144 and/or Lisa 610-804-9133 lisa.gardner107@gmail.com . NAMI In Our Own Voice – is a presentation for the general public to promote awareness of mental illness and the possibility of recovery.